Due to Tabriz’s strategic location along the Silk Road, it has long been an important hub of commerce. Construction started over a millennium ago, making it one of the oldest bazaars in the Middle East; however, much of the brick domes date back to the 15th century, which actually gives some areas a somewhat modern feel. When Tabriz served as the capital city of the Safavid dynasty in the 16th century, the bazaar enjoyed an especially prosperous period, and over the years, it has played host to various functions from mercantile to social to religious. It joined the UNESCO rankings in 2010. For centuries, the endless labyrinthine of architectural marvels combined with colorful charm of traditional goods and scent of oriental spices has allured visitors of the bazaar. Located at the center of Tabriz, the complex was one of the most important international trade hubs between the 12th and 18th centuries and it still serves as the economic heart of northwestern Iran. Many world explorers and writers throughout the history, including Marco Polo, Yaqut al-Hamawi and Jean Chardin, have lauded the glory of Tabriz Bazaar as a remarkable part of their adventures. We arrived at the Grand Bazaar late in the afternoon. It still is a popular shopping district in this city of 1.5 million inhabitants, and many shoppers were about. Both modern necessities such as kitchen utensils and traditional goods like nuts and spices are sold. The figs especially are to die for, soft and sweet – nothing liked the dried out objects you’ll find in supermarkets in Europe. Despite the bazaar’s age, it does feel quite modern and not as atmospheric as for example the medina’s of Fez and Marrakech. People in my tour group that had been to Aleppo, the most similar WHS because it’s also a covered bazaar, preferred that one over Tabriz too. The bazaar is an exceptional physical, economic, social, political, and religious complex that provides evidence to a civilization that is still flourishing. Over the centuries, Tabriz Bazaar developed into a socio-economic and cultural system in which specialized architectural structures, functions, professions and people from various cultures integrated into a unique living ambiance. 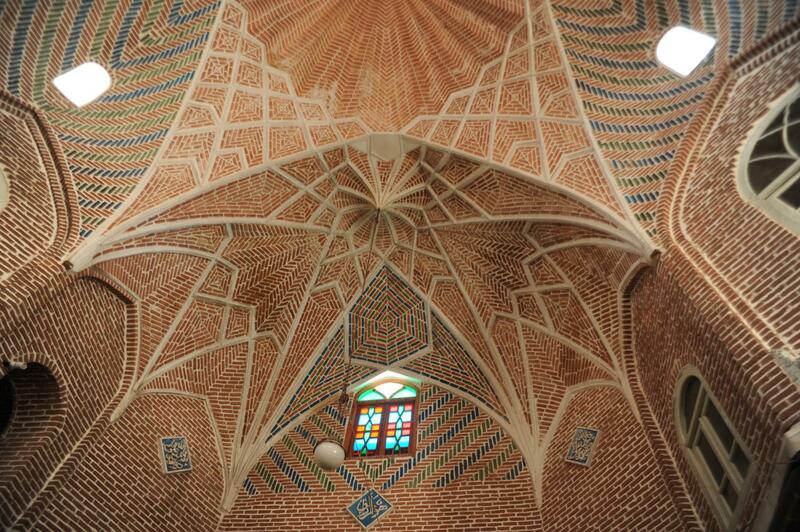 The historic Tabriz Bazaar is an outstanding example of an integrated multi-functional urban complex in which interconnected architectural structures and spaces have been shaped by commercial activities. A large number of specialized buildings and structures are concentrated and interconnected in a relatively compact area to form what is almost a single integrated structure. Strolling through the nearly seven square kilometers of interconnected red brick vaults, even the hardest-to-please traveler is sure to be enchanted by the Tabriz Bazaar. Each hall is dedicated to a particular item: the Amir Bazaar specializes in gold and jewelry, while the Kolahdozan Bazaar sells traditional Azeri hats made of wool. Other paths will take you down quarters for quality leather goods, handcrafted copper products, irresistible spices, and the freshest fruits and vegetables. Keep your eyes out for the original calculator, the abacus, which some shopkeepers still use to calculate the total (and keep their mind sharp). The one-square-kilometer trade center consists of 5,500 stores selling the products of over 40 types of professions, 60 timchehs (sub-bazaars) and saras (small caravansaries), 30 mosques, 20 alleys and sub-bazaars, five baths, 12 schools and five museums. Similar to many other Middle Eastern bazaars, Tabriz Bazaar was a key commercial center for religious minorities, with Armenians and Georgians owning a major part of businesses and conducting important transactions with European and Central Asian merchants. The bazaar was destroyed as a result of several massive earthquakes, but it was reconstructed afterwards. In the latest case in 1780, the bazaar was completely destroyed by a huge earthquake and was rebuilt flowingly. 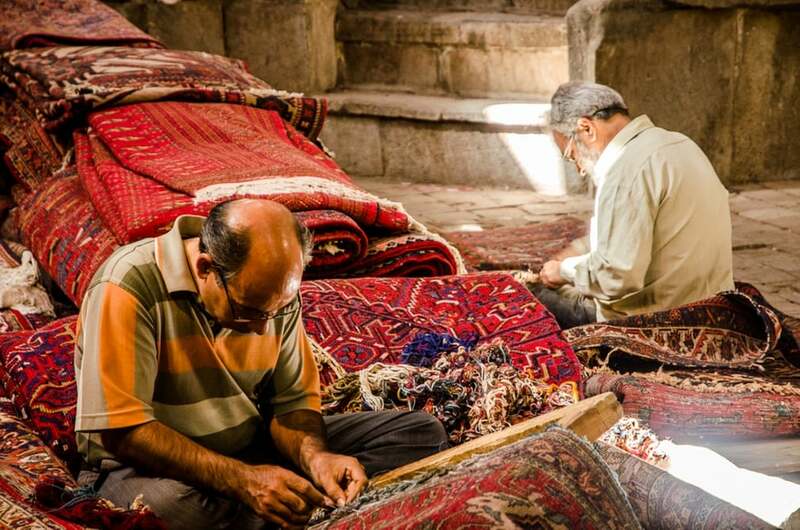 In 2,000, the Cultural Heritage Organization of Iran began a renovation project for the bazaar in cooperation with the shop owners. The project won the Aga Khan Award for Architecture in 2013. The masterfully-designed high vaults and domes of the structure decorated with intricate brickworks and tileworks have turned the complex into an outstanding masterpiece in oriental architecture. The complex consists of several sub-bazaars or timchehs. 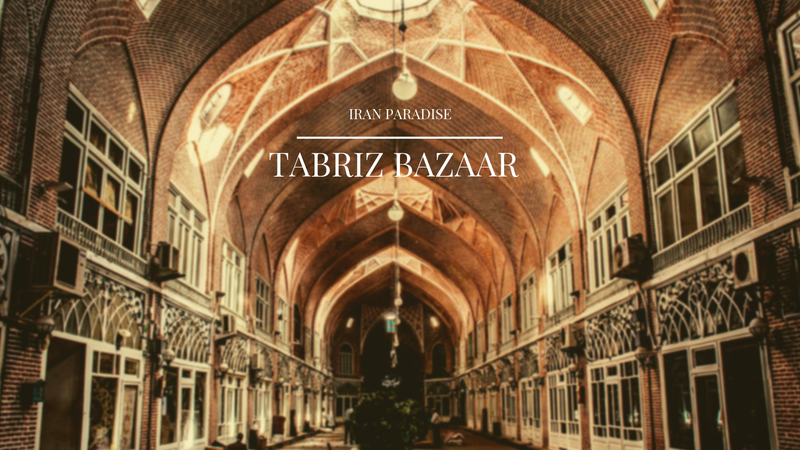 The most important and luxurious part of Tabriz Bazaar is Amir Bazaar, also known as Timcheh Amir, where shop exclusively sell gold and jewelry. The section has the largest dome in the entire bazaar. Another important section is Mozaffarieh Bazaar, also known as Timcheh Mozaffarieh, for sale of exquisite Persian carpets. The most beautiful architectural design in the complex belongs to this section. This mosque was built in the style of the Mongolian Timurid dynasty in the second half of the 15th century. Tabriz was at that time the capital of East Persia. The mosque has suffered badly during the past – an earthquake in 1779 largely destroyed it. On 19th century sketches made by passing European travelers it is shown as virtually a ruin. Since then much brickwork has been added to make it whole again. But it is far from finished – according to our guide there is disagreement about how to proceed. Although certainly worth a visit for a couple of hours, Tabriz Bazaar was the least exciting of the 6 WHS that I visited during my tour of Northern Iran. But the name ‘Tabriz’ for me will forever be connected to the ‘Tabriz meatballs’. Ordering this from the menu in a touristy restaurant in Tabriz’s Luna Park, I expected to get something like kofta. But this is one big ball of ingredients, filled at its core with egg and chicken. With some difficulty I managed to eat half of it. Other sub-bazaars are dedicated for the sale of a variety of other handicrafts, foodstuff and household items. The majority of timchehs and saras consist of three-floor buildings where the first floor is used as the warehouse, the second floor as the business office and third floor as the resting space. 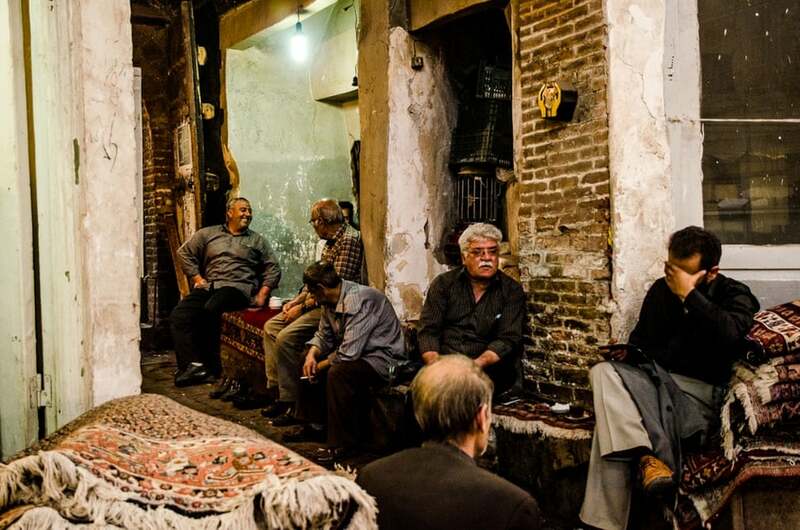 Apart from its economic status, Tabriz Bazaar has also been a hub of key social and political developments in the Iranian history, including Iranian Constitutional Revolution in the beginning of the 20th century and Islamic Revolution in 1979.